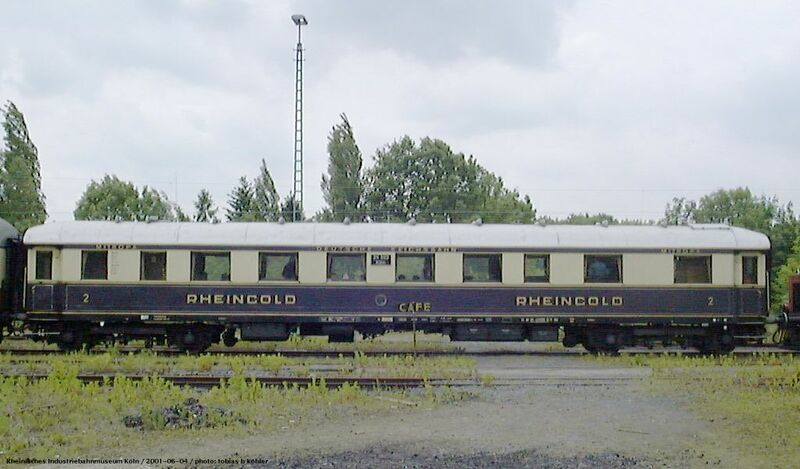 Rheingold car of 1928 in the "Rheinisches Industriebahnmuseum" in Köln, where the FEK (Freundeskreis Eisenbahn Köln) is maintaining historic rolling stock. 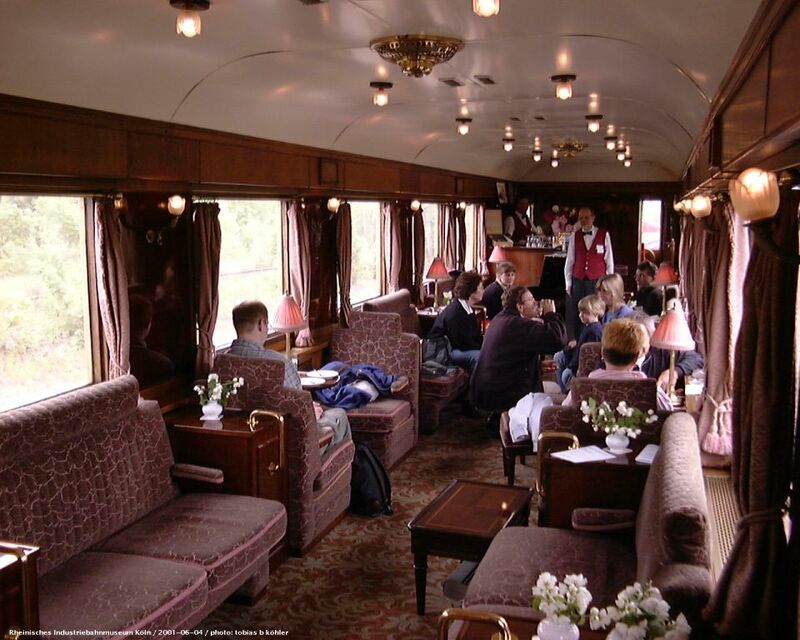 This one used to operate in the "Venice Simplon Orient Express" and received a special interior for that service, but is now out of service due to need of overhaul. 2001-06-04. Interior of the 1928 Rheingold car serving as a café. 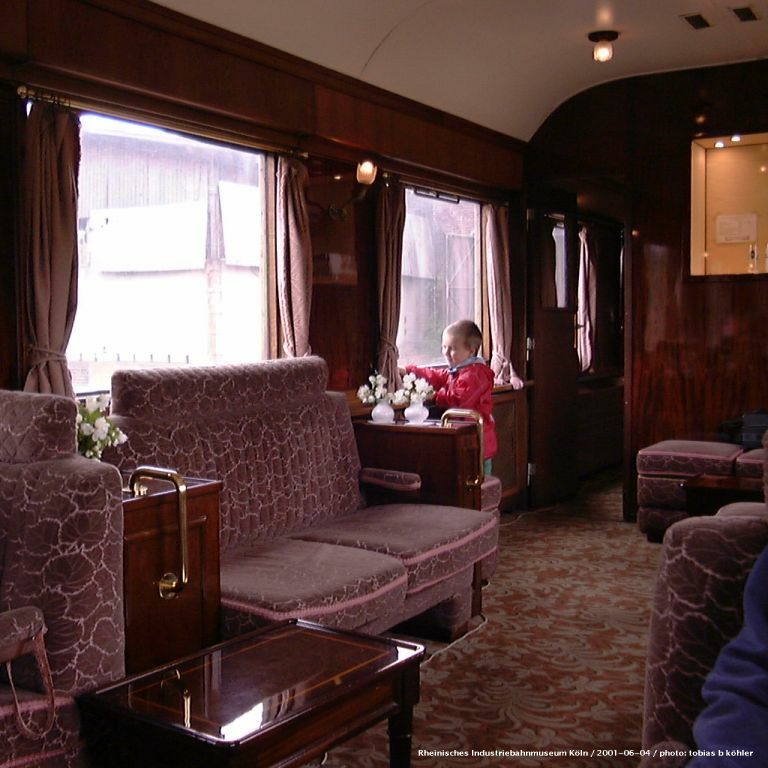 This is not the original interior, it was rebuilt several times, here we see the interior that was installed for the Venice-Simplon-Orient-Express. As the car is in need of overhaul, it is only in stationary use currently. Rheinisches Industriebahnmuseum Köln, 2001-06-04. Another coach of the Rheingold of 1928. 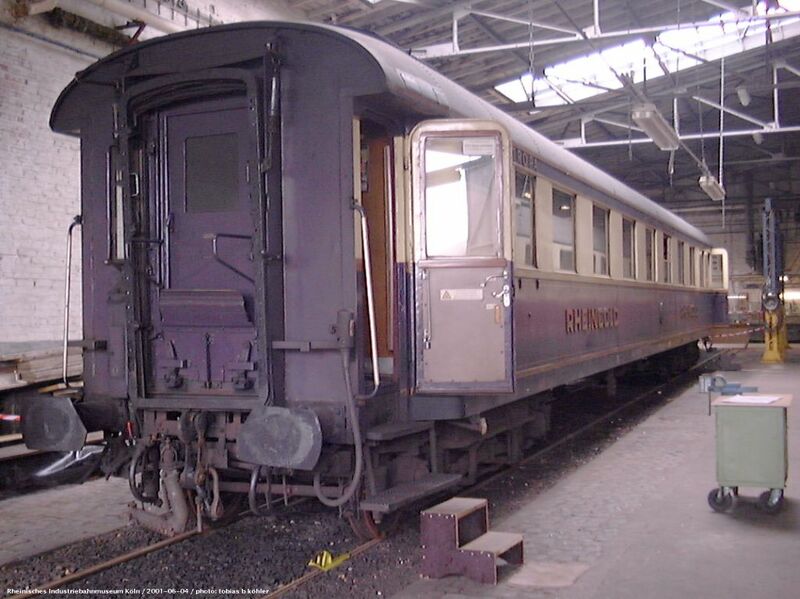 It has been rebuilt into a normal compartment car by the DB in the 1950s, now it is restored to its original livery externally, but still has compartments inside. Rheinisches Industriebahnmuseum Köln, 2001-06-04. TEE dining-car WRmh131 in the "Rheinisches Industriebahnmuseum" in Köln, where the FEK (Freundeskreis Eisenbahn Köln) is maintaining historic rolling stock. Only five of this type were built in the early 1960s, they have a double-deck kitchen and a spacious 48-seat dining room. After their original ivory and dark blue "Rheingold" livery, they were repainted into TEE colours in the mid-1960s, keeping their DSG inscriptions at first. They were retired in the 1970s. 2001-06-04. The space-saving double-deck kitchen in the WRmh 131 allowed a rather spacious dining room with 16 tables and 48 seats as we see it here. The loudspeakers were added later. 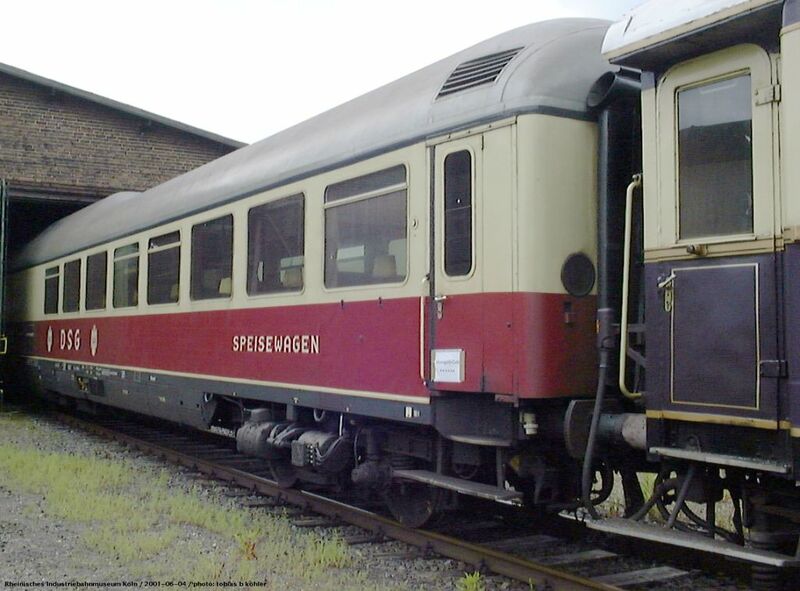 This car was part of the consist of the Rheingold 1962 and usually running next to one of the dome-cars ADmh 101 (which were meanwhile sold to several different owners and are currently operated by Tågkompaniet in Sweden). Rheinisches Industriebahnmuseum Köln, 2001-06-04. 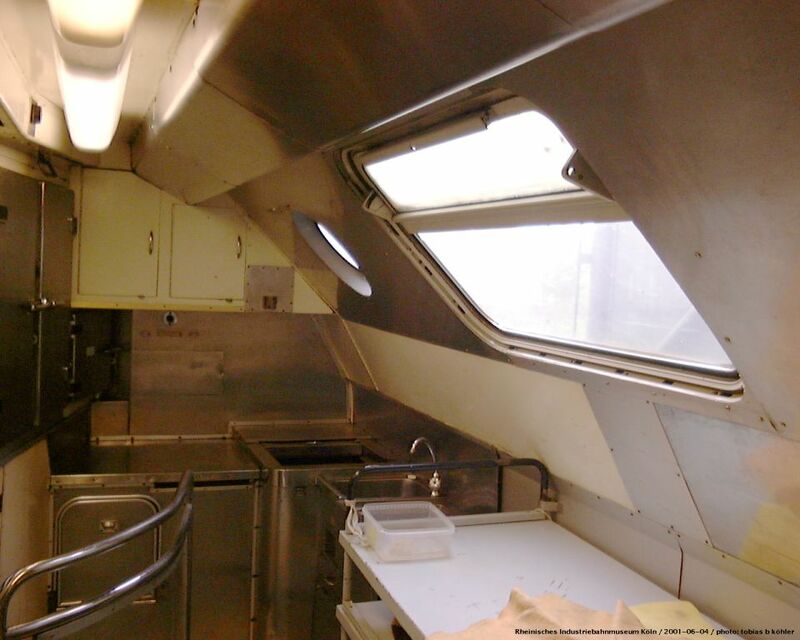 Interior of the upper part of the kitchen in the TEE dining-car WRmh 131. I think originally it had three big windows up here. This room consists of storage space, fridges and facilities for dishwashing. Rheinisches Industriebahnmuseum Köln, 2001-06-04. 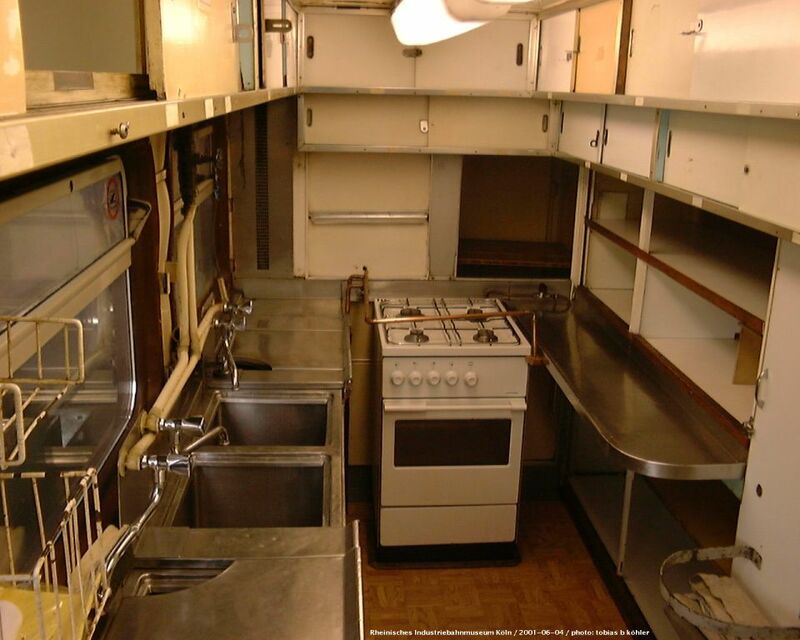 Interior of the lower part of the kitchen in the TEE dining-car WRmh 131, with a gas stove. 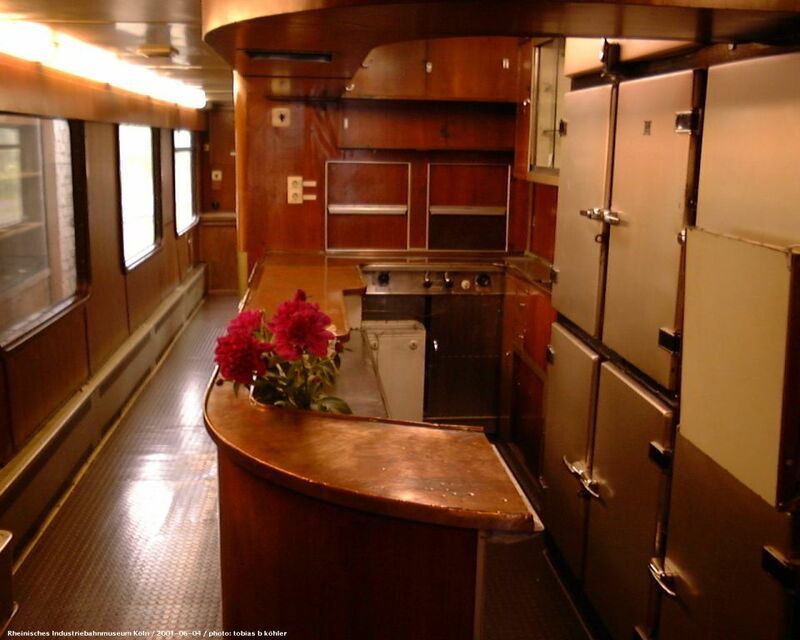 The double-deck kitchen consisting of two small rooms connected with a lift was soon considered impractical, which is why later dining-cars have a normal single-deck kitchen again. Rheinisches Industriebahnmuseum Köln, 2001-06-04. 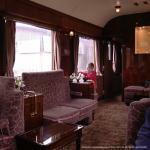 Buffet in the TEE dining-car WRmh 131. You can see the two elevators connecting to the two levels of the kitchen. Rheinisches Industriebahnmuseum Köln, 2001-06-04. TEE bar car ARDmh105 in the "Rheinisches Industriebahnmuseum Köln", preserved by the Freundeskreis Eisenbahn Köln. 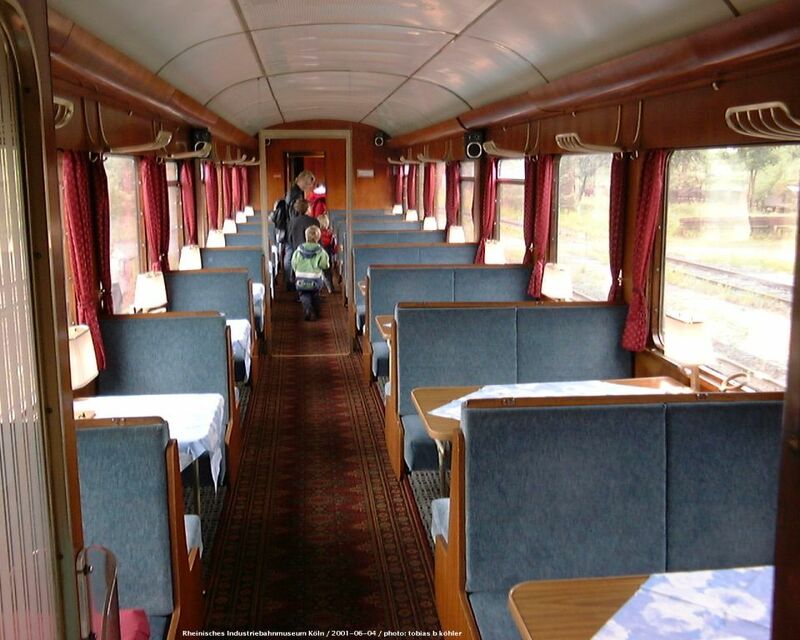 This type of car was used in TEE trains in addition to the dining-car for those who just wanted to have a drink together. They were retired when the TEEs were converted to EC/IC. 2001-06-04.